I know I haven’t posted a recipe in a while and this blog is way overdue. It’s not that I haven’t been cooking, I just haven’t been cooking anything blog worthy. Nursing a cold this weekend and craving hot spicy soup, I remade this stew this weekend. Upon seeing these photos you may be somewhat confused. 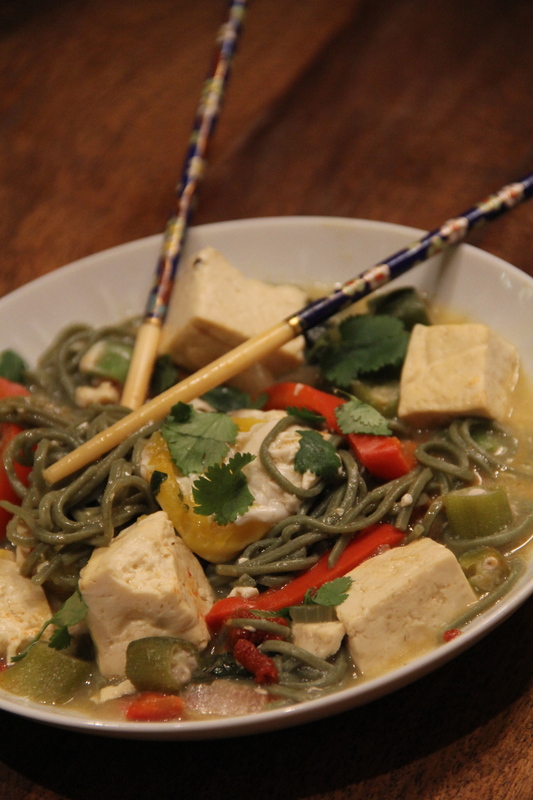 Soba noodles aren’t usually green! 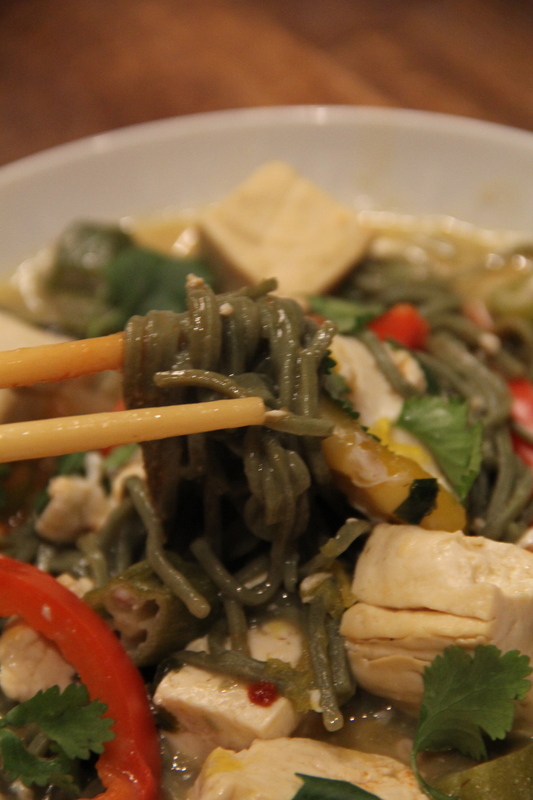 Those of you who are well-versed in Asian cuisine may assume that these are cha soba noodles, or green tea soba noodles. Although green tea soba sounds delicious and nutritious, these green noodles get their color from mugwort rather than Camellia sinensis (the plant green tea comes from). Mugwort is a plant that is used medicinally in Japanese, Chinese, and Korean culture, and it is sometimes taken to relieve stomach and digestive issues. I chose to use mugwort soba, as I was interested in the flavor this bitter herb could add to my stew. You should be able to find mugwort soba at your local supermarket or health food store, but if not regular old soba works just as well. It just doesn’t look as cool. Throw onions in a large pot with a tbsp of oil and cook over medium heat until golden and no-longer crunchy. Add mushrooms, carrots, okra and chopped bell pepper. Stir and cook for 10-15 minutes. Add vegetable broth. Cover and let simmer for about 1/2 hour or until carrots and other veggies are soft. 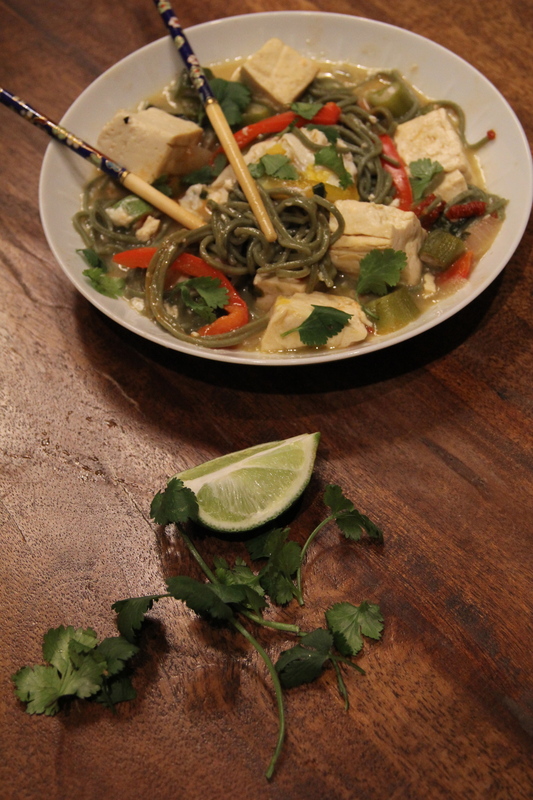 Add soba noodles, tofu and miso and let simmer for 10-15 minutes or until both noodles and tofu are cooked. Add lime juice to taste. Serve topped with green onions and cilantro.